The survey, conducted in January, shows the increasing use of conservation technologies. Every two years Plumbing & HVAC surveys our readers on the trends that they see in the industry. Our second trends survey took place in January. Last conducted in 2016, your responses were more numerous this time with 121 readers completing the questionnaire, making the results more reliable from a statistical standpoint (please see Methodology, below). 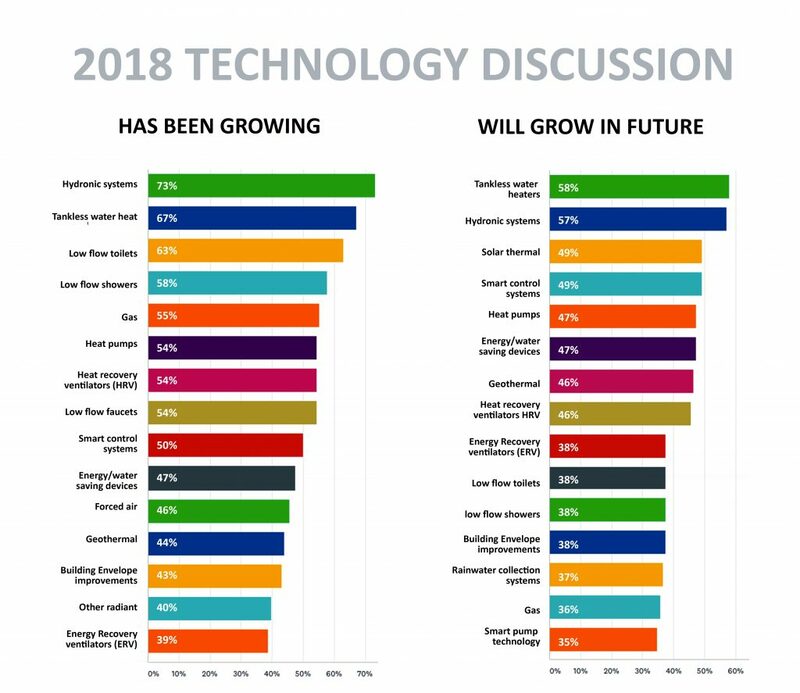 As you can see from the charts, many industry professionals expect strong future growth from hydronic systems, tankless water heaters, smart control systems, heat pumps, conservation and energy recovery technologies, and in the geothermal area. Surging: The big stories in terms of the difference between what you said a few months ago and what you said a couple of years ago would be tankless water heaters and smart control systems. Tankless went from zero votes to first place with the most votes, mentioned by 58 percent of respondents. Smart controls went from zero votes to being mentioned by 49 percent of readers. Smart pumps and heat pump water heaters jumped into the limelight from zero votes a couple of years ago to being mentioned by 35 percent and 28 percent of you, respectively. Holding strong: Hydronic systems continue to dominate future predictions at or near the top of the voting charts. Geothermal was selected by more than four out of 10 professionals, and better building envelopes held strong in the check-off voting and were also mentioned by many of you in the written comments. Readers continue to report growth in HRVs and ERVs, and about one-third of you believe drain water heat recovery and greywater recycling will continue to grow. Heat pump selections, rainwater collection, and low flow faucets went down a little on the check-off votes, but in the written comments the first two were mentioned frequently as key new realities in our business. Low flow faucets are still expected to grow by about one third of participants, and given regulations and penetration levels, it’s safe to consider them an enduring trend. Similarly, solar air was mentioned this time by 38 percent, a slight increase and a fairly solid prediction. Entering the conversation: Liquid cooling for data centers emerged, finally, moving from zero votes in 2016 to 11 percent in 2018. Up a few points: Electric heat, sewage heat recovery, black water recycling, and deep-water cooling all edged up, and were mentioned by 10 to 20 percent of respondents. Edging down: Free cooling, biofuels, wood heat, biomass, low flow toilets (which are now old news) conventional faucets and showerheads all crept down a bit but still may be used more in the future. Heading south: While still expected to grow, forced air mentions went down from 44 percent to about 31 percent, and gas too, from 44 percent to 35 percent. In the written comments for plumbing, by far the most common comment related to fittings: Press Fit, SharkBite, etc. It seems that these are being quickly integrated into everyday use and most see it as a positive development – less soldering, new tools, faster installations. The second area often mentioned is the increasing role of plastics in piping, including PEX, PVC, CPVC, ABS and more. Some like it, while some criticized the quality. This was more of a subject of debate in 2016. Now they seem to have been accepted as here to stay but are still considered new by many. Plumbing professionals also talked about the technologies that they selected in the check-off section, such as tankless and hydronic systems. They mentioned that efficiency, conservation and water re-use remain huge themes, and that they are seeing more adoption of smart pumps, variable speed and ECM equipment, controls, recirculation, back-flow prevention, luxury and electronic plumbing fixtures, and snow-melt systems. The written comments for HVAC were similar to those in the 2016 survey. Efficiency and electronics were big themes and they continue to be the most dominant. Efficiency, conservation, energy recovery, and better ventilation seem to be a part of every HVAC conversation. A related but slightly separate common theme is indoor air quality. Electronics, precise system control, smart and remote monitoring, are all ramping even faster than in 2016, and the dawn of Internet of Things (IoT) and preventive maintenance diagnostics might actually be here. Although mentioned frequently a couple of years ago, today variable speed technology, smart pumps and ECM motors seem to be getting a lot more respect for their efficiency contributions, and their adoption is clearly accelerating. The big issues are changing codes, training and skills, and the most frequently mentioned technologies in the written HVAC comments are hydronic systems and heat pumps. In the written comments for refrigeration, “C02 is back,” said one survey respondent. Although this might still be more of a prediction than a reality, it’s not a stretch to think that two years from now when this survey is undertaken again, C02 will be prominent in refrigerant discussions. However, participants commented mostly about new refrigerants and regulations, specific blends and replacement practices. Electronics, including smart controls, boards, gauges, programming, and training on digital systems, was, of course, the next most popular topic. This was closely followed by refrigeration efficiency and inverter technology. Taken together, there is a real sense that increasing efficiency benchmarks and clean operating systems in regulations have now significantly manifested. The other top concern is sophisticated, precise technology and practices are both an advantage and a challenge for many professionals. We’re now planning for, rather than debating, greater electrification and tighter building envelopes. Even off-grid structures with electricity storage and micro-networks are being viewed with reduced skepticism. The future is coming at us. There are a lot of changes in the air, and with surveys like this, Plumbing & HVAC Magazine will help keep you fully engaged in the future trends conversation. Plumbing & HVAC developed a questionnaire and posted it to our website in early 2019, and promoted it using email blitzes to readers and some of our industry contacts. The questionnaire was designed to be fairly easy to answer, with just five questions, including two multiple choice check-off type questions. The questionnaire remained essentially the same in both the 2016 and the 2018-19 surveys, except that some new technologies were added. This is intentional, as we believe one of the valuable aspects with a ‘trends survey’ is to be able to compare perceptions over time. We plan to repeat the survey every two years and expect the value of its conclusions to continually increase. This latest survey received about 30 percent more respondents than a couple of years ago, so our sample size was reasonable, and our margin for error is likely greater than five percent but less than 10 percent. The fact that our respondents were likely all readers of our magazine gives us confidence in the targeted quality of the responses, and we see it as a reasonable barometer within the plumbing, heating, cooling and refrigeration industry in Canada. The open-ended questions proved to be a useful complement to the check-off questions, because of the interpretation limitations of the latter format. The check-off format helped keep the questionnaire simple and easy to complete, but on its own, would probably limit our understanding of the results. Metrics indicated that each respondent spent just three to five minutes completing the survey.